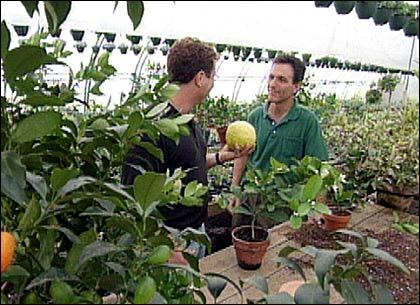 Byron Martin explains the process of planting citrus in containers, as Michael inspects a gigantic Ponderosa lemon. Not a native Floridian? Well, don't rule out growing your own lemons and limes just yet! Citrus guru Byron Martin, of Logee's Greenhouses in Danielson, Connecticut, shares his tips for growing healthy, happy citrus plants indoors. Although all citrus plants make good container plants, there are a few varieties that fit pot culture better than others. Generally those that grow and flower freely or hold their fruit for extended periods of time give the indoor gardener the greatest rewards. Some varieties that fit this description are lemons, of which the Ponderosa and Meyer are excellent choices. In addition, the Persian lime and the Key lime both perform well in pots. The Calamondin orange has a long history in container culture as it holds its fruit for months and has a compact growth habit. Kumquats, which also hold their fruit well are most entertaining subjects for containers. 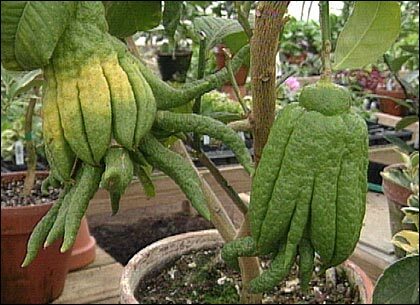 Two novelty types worth noting are the Citron Buddhist Hand, with its long-fingered fruit and the Kaffir lime, which is used popularly in southeast-Asian cooking. The blood orange has ornamental appeal with its unusual purple flesh, although is a slow grower. The edible citrus like oranges, tangerines, grapefruits and their hybrids also do well, but they just don't grow as fast, and tend to grow and flower more seasonally. 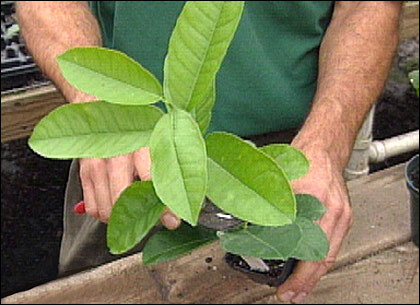 You can control the shape your citrus plant grows to through pruning. In culturing citrus in containers, some direct sunlight is needed to help them flower and fruit. Eastern, western and southern exposures are all fine, a northern exposure being the only direction to avoid. During the winter months it's best to maintain temperatures above 60 degrees Fahrenheit, as this will help keep the root system active. At other times of the year, when the days are longer, this is obviously not such an issue in most places. First, you want to be sure to culture your citrus in clay pots from the very beginning. Clay will ensure good drainage and aeration, and promote development of a healthy root system. Second, don't over-pot; in other words, start out in a small pot and continue to repot the plant in successively larger containers as it grows. Commonly called 'Buddhist Hand', this unusual citrus variety has a sweet rind that can be candied. Depending on how you ultimately want your citrus plant to show itself  tall and treelike, or short and bushy  you can use pruning to control the shape of its growth. Without drastic pruning, the plant will naturally grow upright along a single stem. But by aggressively pruning back the central stem early on, you can cause the auxiliary buds to begin to flesh out, which will create a fuller structure to the plant. Water thoroughly when the soil appears dry on the surface, but do bear in mind that citrus plants will do better when they have a period of dryness in the soil between waterings. This allows oxygen to get to the roots, helping to maintain root health. At the same time, try not to subject your citrus to a severe wilt. Fertilize at moderate levels with a balanced, soluble fertilizer, preferably one that contains added trace minerals. Too much fertilizer  although it will make your plants grow fast  tends to cause weak growth, which creates a greater susceptibility to diseases. An application of diluted fertilizer once or twice a month is adequate; discontinue fertilizing in late fall and winter. Finally, probably the greatest challenge in growing container citrus is maintaining a healthy root system, and one of the main causes of decline and death of potted citrus is root disease. Disease is more prevalent during the winter months when plants are under the stress of cool temperatures and low light. Insects  mainly mealy-bug and scale  can also pose problems, and spider mite on occasion can be an issue too if plants are summered outside then brought in for the winter. All of these pest problems are relatively easy to control with applications of pure Neem oil, a natural product that is safe for both the environment and the gardener alike.